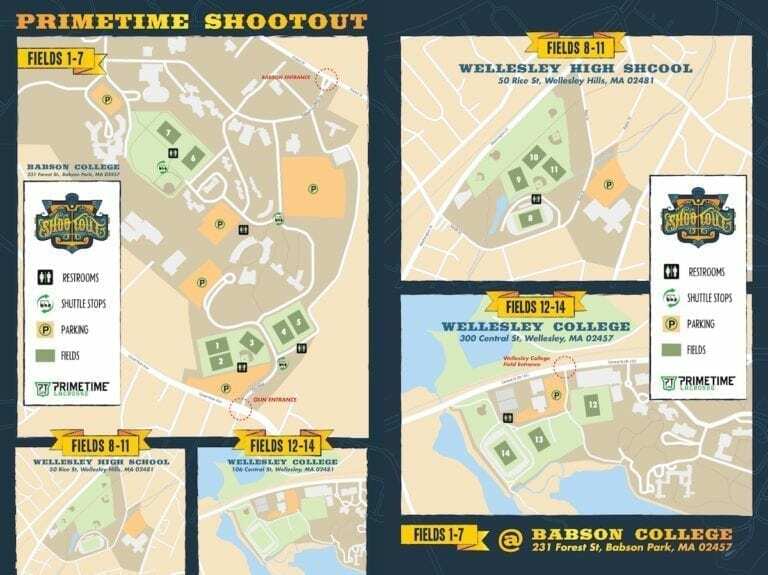 Founded in 2010 and based in Massachusetts, PrimeTime Lacrosse hosts nine lacrosse events for elite youth and high school clubs each year. Providing a positive event experience for our customers is our number one objective at every single event, and today we’re pleased for the opportunity to tell the worldwide lacrosse community a little about how we execute! The work to create a positive event experience needs to kick off months, if not years, in advance in order to achieve success. Location, field space, parking and restroom facilities are just four key criteria that should be zeroed in on before proceeding. Participant and family safety is our first priority as we work to create a positive event experience at all tournaments and camps we operate. We would rather be “overstaffed” with our athletic trainers and medical staff at all events – this even includes an on-site ambulance at the Bulldog Brawl. We make sure to have our staff prepared for a variety of matters that can come up over the course of any event. Step 3) Relay the right information to families and clubs – clarity matters! We take the time to make sure we’re relaying the right information to families and clubs in an organized, clear way well in advance of an event. Then, we continue our commitment to excellent communication during- and even post-event as well. Distributing information in a clear way to families and coaches helps take the stress out of what’s already sure to be competitive weekend. – Phil JacksonEnsuring great on-field competition is critical to a team’s positive event experience. We pour over a lacrosse program’s previous results and speak in-depth with each club’s director to ensure each team is scheduled to play other teams appropriate for their level of competition. From a competitive standpoint, the worst thing that can happen at an event is having too many lopsided games. Lopsided games leave coaches and families on both sides feeling unsatisfied with their event experience. It’s important to balance the competition as much as possible. Finally, we talk all the time about the PrimeTime Lacrosse Events difference being in the details. We have more signage at events than any event our founders have ever attended, and that’s saying something because our team is made up of former NCAA lacrosse players turned college coaches. We have a shuttle service to take families to and from the parking lot, and we go over the top to make sure that division winners truly feel like champions with individual medals and the banners each team receives to keep to display at their office or home location. We make sure our event staffers know that they’re in the hospitality business, and their sole mission at each event is to ensure an incredible experience for everyone involved. These are just a few steps we at PrimeTime Lacrosse take to excel and grow at our own pace in the events industry. Learn more about our lacrosse events at PrimeTimeLacrosse.com!